Wow! 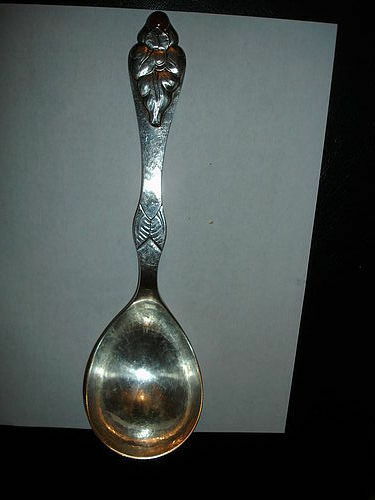 Fabulous Large Danish Skonvirke Handwork Serving Spoon in Sterling Silver with Amber Cabachon. It is a stunning piece measuring appx 10.25 inches long. The bowl is about 4 inches by 2 7/8 inch. Weight is 4.7 ounces. It is hallmarked with 3 towers to signify Danish Sterling, maker's mark of CMJ stylized and small punch mark I can't decipher. It is also engraved on back handle Erindring om 70 Aars Fodseldagen 8/2 1929 and monogram AEM. A gem!